Toyota’s new Supra is almost ready for its reveal. The current thinking is the car will make an appearance at the 2018 Geneva International Motor Show in early March, which would mean we should see it in showrooms as a 2019 model. Toyota is yet to confirm the Supra name, but there have been plenty of hints it’s making a comeback. Most recently it was revealed that Toyota in 2016 trademarked the Supra name for the European market. There have also been hints that the new Supra could be linked with Toyota’s GR performance sub-brand launched in Japan last September. GR is a reference to Toyota’s Gazoo Racing motorsport department, and cars from the sub-brand fall into various performance categories. 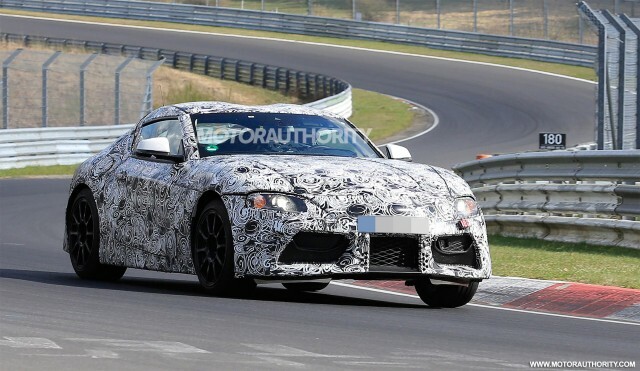 And according to Auto Express, the same will be true for the new Supra. The British rag reports that that there will be four levels of performance for the new Supra: base, GR, GR Sport and GRMN. GRMN is the range-topping option. It stands for Gazoo Racing Masters of Nürburgring, and cars classified as GRMNs can be compared to top offerings from the likes Subaru’s STI and Mercedes-Benz’s AMG divisions. The first GRMN model is the Yaris GRMN. There aren’t any details on what a Supra GRMN might be like, but we could potentially see a performance-oriented hybrid powertrain introduced. The reveal of the GR Super Sport hybrid supercar concept earlier this month suggests Toyota is finally serious about leveraging its performance hybrid technology from motorsport for use in road cars. We’ll have to wait awhile longer before Toyota is ready to show its new sports car, but whatever the automaker is planning, the car has some big wheel wells to fill. Is the 2017 Ford GT the best road-going racer ever?